Hope to see you on Monday March 25 at 7pm at the Amy E. Tarrant Gallery. Final event of the Burlington Irish Heritage Festival. Starts at 7, with Ani Kulik and Yasi Zeichner as facilitators/announcers. Donations accepted at the door. The first part (every one takes a turn on the ‘hot seat’ i.e. play something on their on or with others of their choosing) will be done by 8, the last hour 8-9 will be more of a session format (college age or not, all invited to join in). Either way, we plan/need to finish by 9. Featuring fiddlers, accordion players, pipers, harpists, flute players, and guitarists. 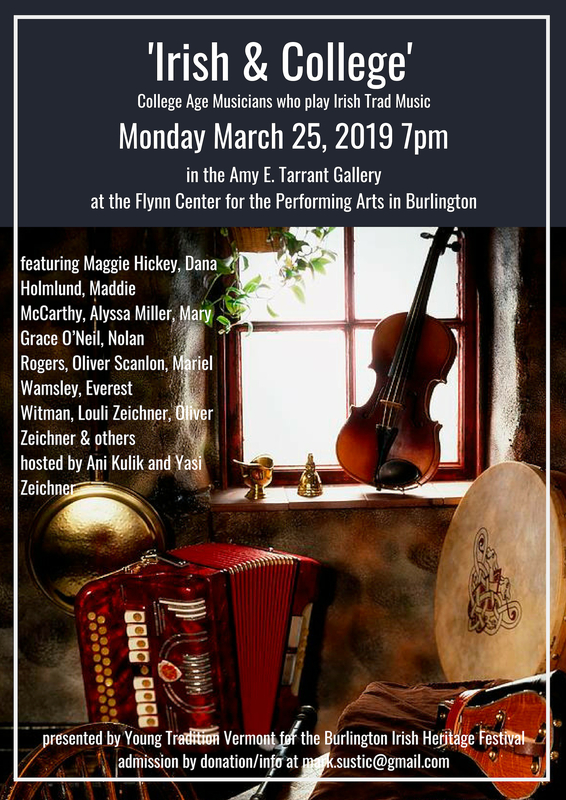 This multi-instrument concert will include individual and group performances by Maggie Hickey, Dana Holmlund, Chris Krag, Alyssa Miller, Mary Grace O’Neil, Nolan Rogers, Oliver Scanlon, Mariel Wamsley, Everest Witman, Louli Zeichner, Oliver Zeichner and others.